I found these small pieces of decorative paper in my Christmas stash and thought I would use them for a thank you card. 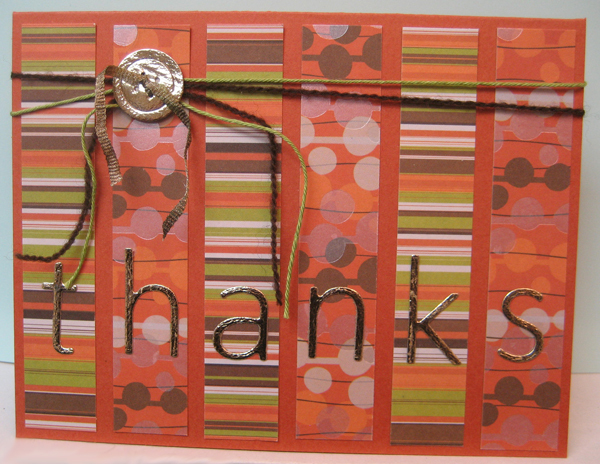 I glued the strips to a rust coloured card front and added some metallic gold die cut letters - one per strip - to spell thanks. I love the texture on these letters and the button too!! I combined a green crochet thread with a length of thin brown wool and tied them to the top portion of my card above the letters using a couple of knots. I added a gold metallic button to which I had tied a length of fiber which I dyed with a marker using two knots and adhered it to my card front over the knots I made in the threads using 3D foam tape. Having some fun in my craft room! !